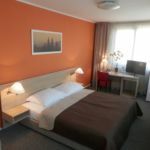 Rooms, services Hotel Ehrlich Prague is offering 43 comfortable rooms to guests looking for accommodation in Prague. The hotel provides a parking space for you. Upon preliminary request airport transfer is provided. You won't have to worry about the heat, air-conditioners operating in all rooms will take care of a pleasant mood even during the hottest summer days. Wireless Internet connection (WiFi) is available in the rooms, enabling portable devices and smartphones to go online without any additional fees. 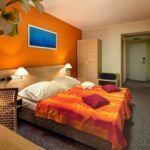 If you wish to learn more about the exact scope of services provided by Hotel Ehrlich Prague (including those available for an extra fee) or about the equipment of the rooms, you can find the complete list on the information sheet below. Location Advent market in Prague is 3.1 km from the hotel. Payment For the reservation you may need to provide advance payment by credit card or credit card guarantee, depending on the exact date, room and price. Arrival, opening hours The earliest check-in time is 00:00, the latest check-out time is 12:00. The rating of Hotel Ehrlich Prague is 8.4 from the maximum 10, 6 based on actual and valid guest ratings and reviews.